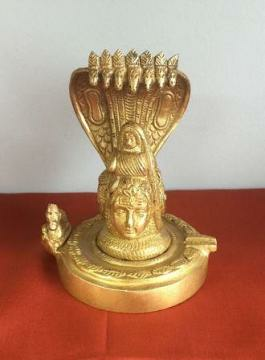 Brass Made Idol of Shiva face on Shivling w/ Nandi 6"
Shivling is very popular for the devotees and is worshiped in every temple dedicated to Lord Shiva. In this spectacular brass figure of Shivlinga, the face is nicely crafted out of brass on a flat Shivlinga and also with nandi. There are some fine carvings on the figure. Shivlinga is widely worshiped during Shivratri as well. Shiva Lingum is a sacred symbol for the devotees. The term ‘Lingum’ (in Sanskrit) means, ‘symbol’. Shiva Lingum, therefore means symbol of Lord Shiva. Siva Linga has been worshiped in Hinduism since ages. This is because the form makes worship simple while maintaining the truth that God does not have any definite form. The beautiful brass Shivling is being protected by the Sheshnag and is being nicely carved out with some deep sense of finesse and delight. Shivling is a key element for any devotee of Lord Shiva. A Shivling is the most sacred part in any temple dedicated to Lord Shiva. Thus it can be used as a home decor item or it can also be worshiped daily or occasionally. Present this beautiful Lord Shivji idol to your loved one on any auspicious occasion to make them feel special. This item in Religious Figurine & Sculptures category was first added to our catalog on 06-08-2017. Buy Brass Made Idol of Shiva face on Shivling w/ Nandi 6", sold & shipped by Little India where you can shop online for Traditional Indian Gifts, Handicraft, Decor, Mandir & Murti. This Idols & Statues collection has been tagged as Brass, Shiv, Shivling, Mahadev, Shankar, God, Religion, Worship, Culture, Puja, Statue & idol.